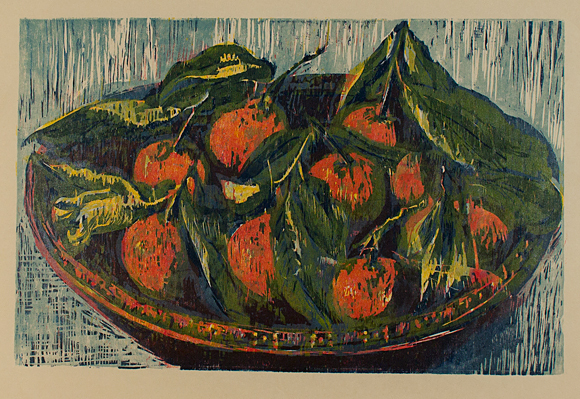 Hilary Daltry is a London based printmaker who’s specialism is woodcut prints. She is head of Printmaking at the independent Art School Heatherley’s in Chelsea. She grew up in Cumbria and studied at Cumbria School of Art before attending the Slade School of Art and Chelsea School of Art as well as a year at the British School at Rome. 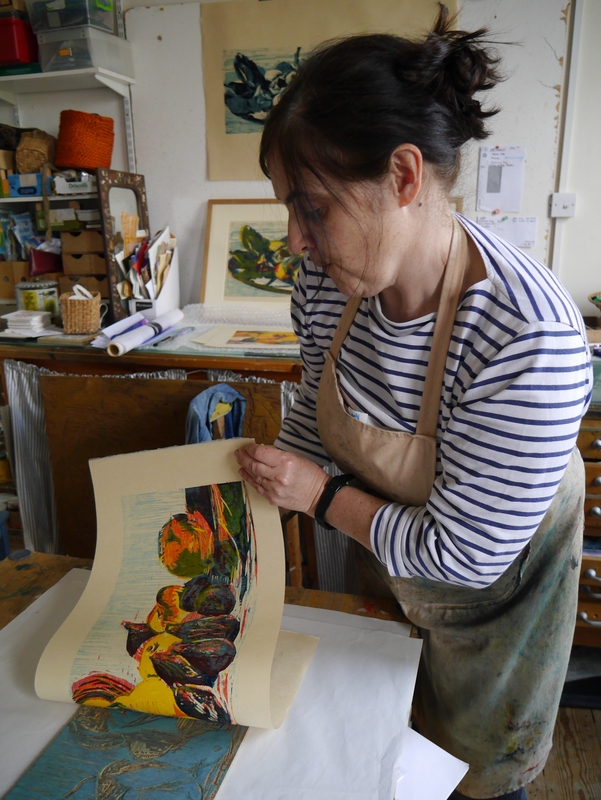 She is an elected member of the Royal Society of Painter Printmakers. She will be exhibiting her work at the R.E. stand (No. 20) at the London Original Print Fair from the 24th – 27th April at the Royal Academy of Arts in Piccadilly. I always start by drawing from life, favourite subjects are inspired by my travels in the Mediterranean. 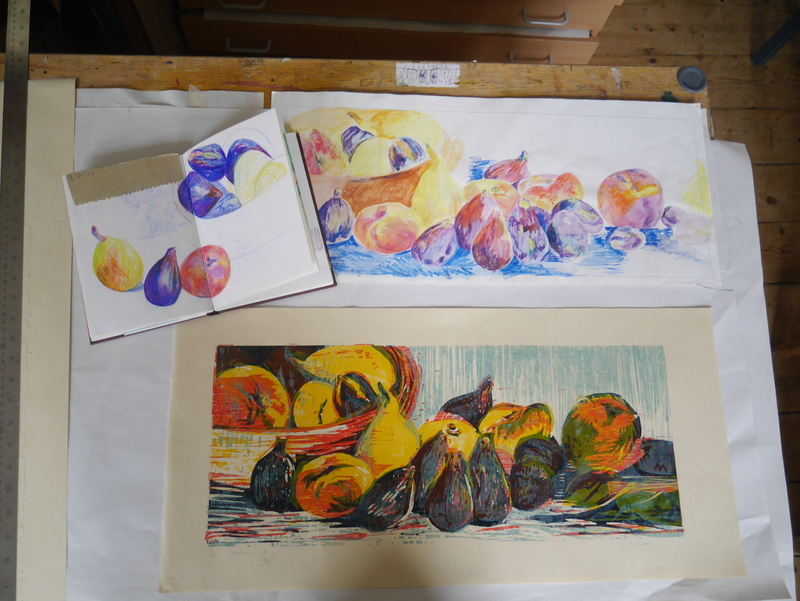 My four block colour woodcut ’Sardinian Figs’ started as studies of fruit in my sketchbook, followed by a watercolour. Then I draw the composition on a plywood block and cut several more pieces of the same size (a block for each colour): drawing is key. My woodcuts are influenced by the Japanese tradition, as well as the European Renaissance tonal chiaroscuro woodcuts currently on show at the Royal Academy of Arts in London. Once I have the composition I use a black permanent marker pen to draw on the wood so the outline remains when I clean ink off the block and then I use white chalk on the block to indicate where to cut first. I always tell my students it’s not what you cut away but what you leave behind that is important! This is relief printing where you cut away the non-printing areas leaving the raised areas to be printed. 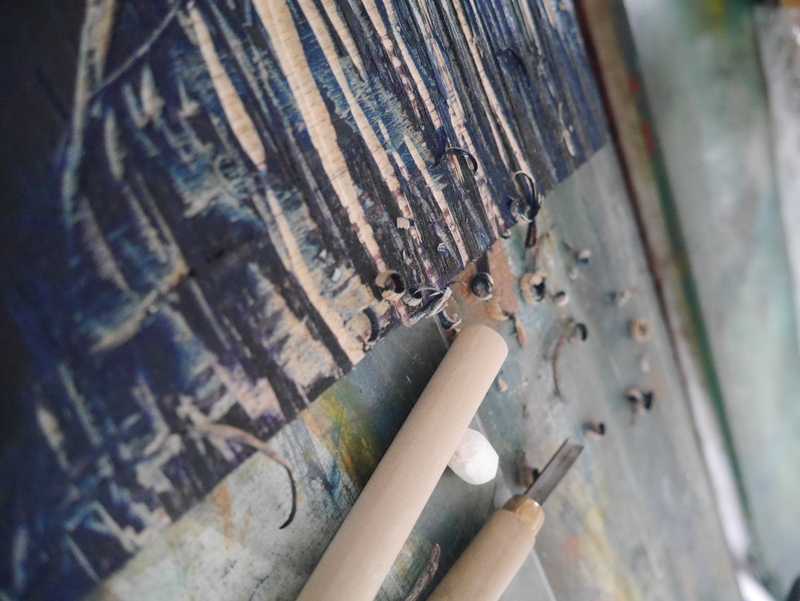 I use various cutting tools (including economy Japanese tools): the gouges for broader areas and the v-shaped tools for lines. Scalpels or Stanley knifes are also useful. The wood I use is relatively soft and inexpensive plywood from a timber supplier. Found pieces can be used e.g. re-using an old pine shelf (it may have a nice grain). MDF or lino can also be used. Once the cutting is finished on the first block I am ready to take a trial proof on newsprint. 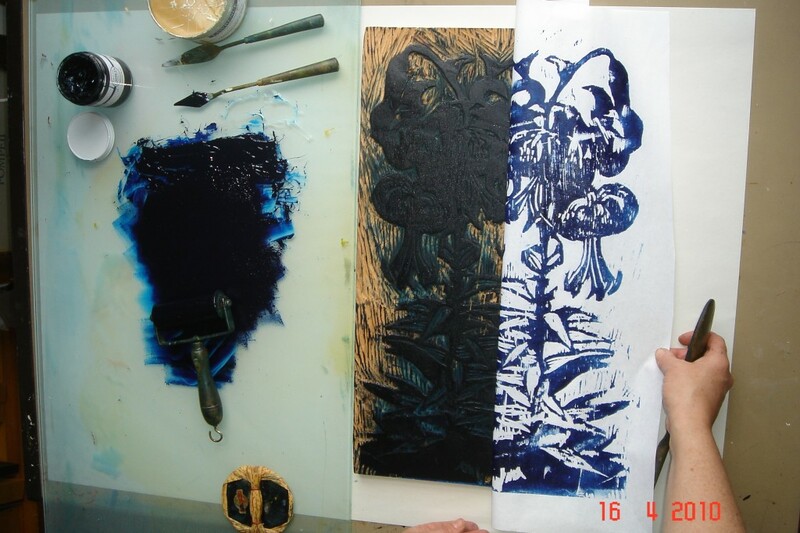 I roll relief-printing ink over the block and then lay the paper onto the block. The paper should be strong yet thin enough for printing by hand and Japanese paper is ideal for this. 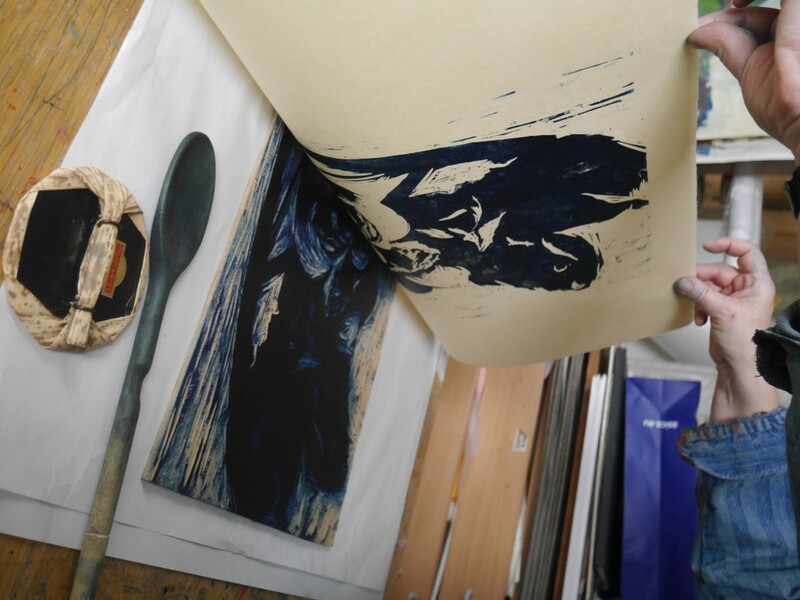 I print by hand, burnishing the back of the paper with a wooden spoon and a Baren (a bamboo leaf covered pad used in Japan) you can manipulate each impression by how much pressure you put on. In order to transfer my image to the other blocks I offset the wet print onto each one. I register the blocks by putting each block down in turn over the first print. Each block is one colour. I have to analyse the colour separation in my mind because the separate colours will mix on the paper. With the primary colours: red, yellow and blue I can achieve rich overlays of colour by changing the sequence in which I print the blocks. I always experiment- it is always surprising and interesting. Woodcut is a very direct medium. When it is cut the wood itself becomes expressive. The outcome is dictated by the way the tools are used. I enjoy teaching at Heatherleys School of Fine Art in Chelsea, London’s oldest independent art school (founded in 1845), where I am head of printmaking. Claude Flight and the Grosvenor School artists were students here and pioneered four-colour linocuts hand printed on Japanese paper. 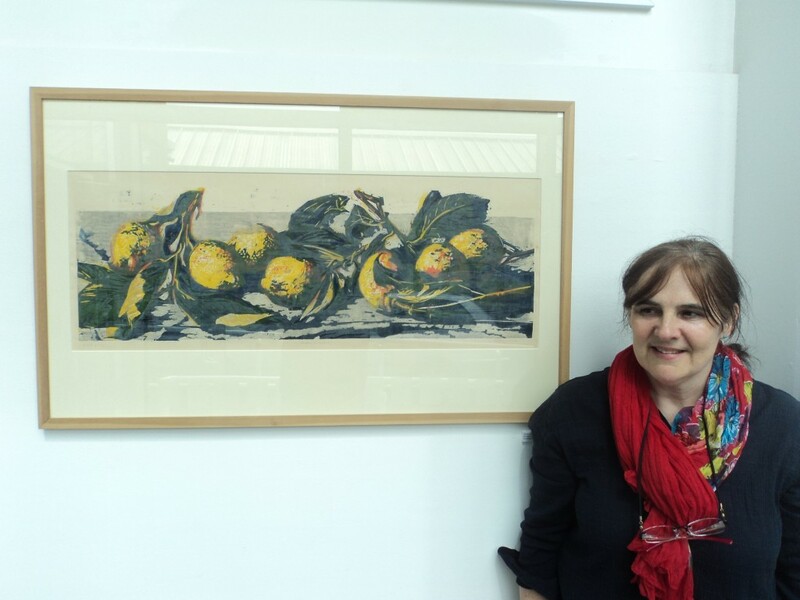 Hilary Daltry is an elected member of the Royal Society of Painter Printmakers. She will be exhibiting her work at the R.E. stand (No. 20) at the London Original Print Fair from the 24th – 27th April at the Royal Academy of Arts in Piccadilly.